Ah-ah, ah! After the events of Sokovia, The God of Thunder, Thor (Chris Hemsworth), has been busy scouring the Earth for Infinity Stones. He’s been hell-bent on prepping his city of Asgard from a destruction known as Ragnarok, a feeling he possesses as a result of his reoccurring visions of this event. Believing that he has prevented Ragnarok from happening after defeating Surtur the fire demon, the hero returns home in good spirits. But, those do not last long, as the defeating of Surtur wasn’t the catalyst to stopping Ragnarok. In truth, Ragnarok has already begun, and the Goddess of Death, Hela (Cate Blanchett), announces it with an impact arrival, obliterating Thor’s legendary hammer and banishing him, along with brother Loki (Tom Hiddleston) to a foreign planet called Sakarr. Led by The Grandmaster (Jeff Goldblum), it’s a place where fatal battles are fought for entertainment, and Thor is forced to enter and fight an old friend in The Hulk (Mark Ruffalo). To get back home and save his home, Thor must fight, and somehow get the help of Banner, Loki, and even a mysterious nomad by the name of Valkyrie (Tessa Thompson) to drive out Hela. If it ain’t broke, don’t fix it. But if it’s fraying, re-coat it. Terrible similes aside, the two Thor movies showcasing the God of Thunder weren’t exactly broken, but the fact is, they are two of the more forgotten or rather, nondescript movies of the Marvel Cinematic Universe to fans, especially The Dark World (truthfully, yours truly is rather fond of 2011’s Thor). So with Thor: Ragnarok, director Taika Waititi (What We Do in the Shadows, Hunt for the Wilderpeople) has certainly left behind a movie that won’t be considered “nondescript.” Has he left a movie behind that many are calling one of Marvel’s best? That’s up for debate. The direction is certainly worth taking note of and remembering. The style the trailers promised is front and center throughout. Asgard has never looked better, but it’s the world of Sakarr—a trippy, futuristic hue of neon colors and post-apocalyptic feel—that stands out the most. It makes the somewhat bumpy first 20 or so minutes worth sticking around for. Waititi’s action, visual flair, and predominately 80’s inspired score/soundtrack coalesce to create something so unlike what has been seen in the MCU up to this point. Even the movies that Ragnarok will be most compared with in Guardians of the Galaxy volumes 1 and 2, the third chapter of Thor is substantially different than those. 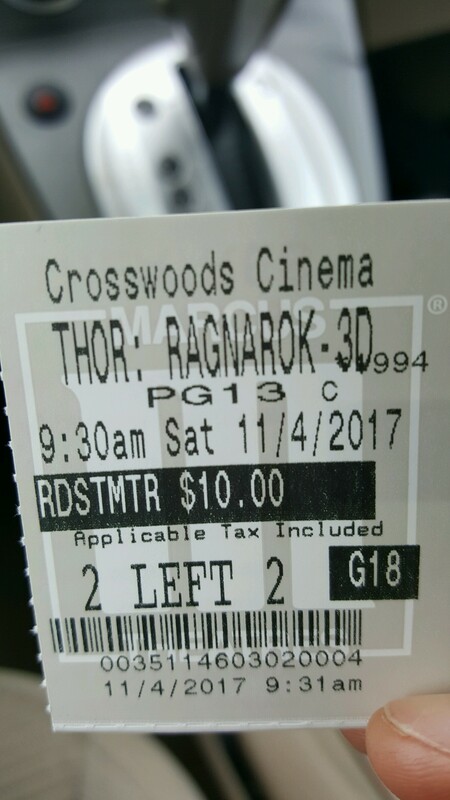 One main thing Ragnarok shares with those movies is an appetite for humor. It wouldn’t be out of line to consider Thor: Ragnarok comedy first, action/adventure second. And for the most part, the comedy hits more than it misses. Seriously, there are some very funny jokes and awesome delivery found in all characters. But honestly, it can get to be a bit much. The story, while functional, kind of seems to be written around the jokes (apparently 80% of the film is improvised). Absolutely nothing is wrong with a lighter superhero film, though going so light while still trying to generate emotion can undermine some of the more dramatic moments of the production. 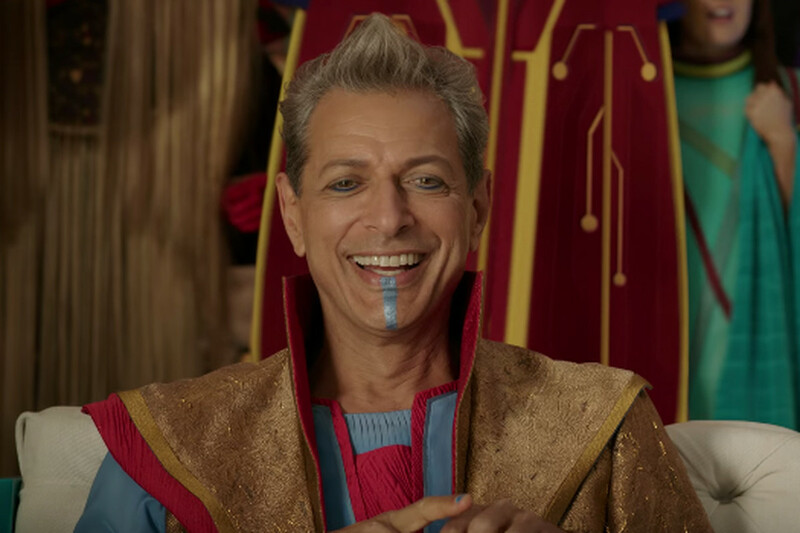 In a few “big” moments, Ragnarok seems to struggle with this, wanting to immediately cut to the next visual gag or joke from something with a serious or vice versa. With that said, one does have to commend those in charge who say they’d like to flip the script and actually achieve in doing it. Thor: Ragnarok isn’t a Jason Bourne, a franchise in which director and lead actor said they’d never do another unless they could do something else—only to proceed with doing the same thing they had done three movies prior. The changes in Ragnarok seem to revitalize the main holdovers from the prior installments in Hemsworth and Hiddleston. Both seem to really be having fun like never before, and the machinations of the story allow them to take advantage of their natural chemistry. Those who wanted more Hulk get their wish granted; the not-so-jolly green giant has a load of screentime and Ruffalo handles the two parts of the beast and Banner like only he can. Newbie to the MCU Tessa Thompson brings a great new character into the fold as Valkyrie, the foundation and backstory being laid for her own potential standalone journey. 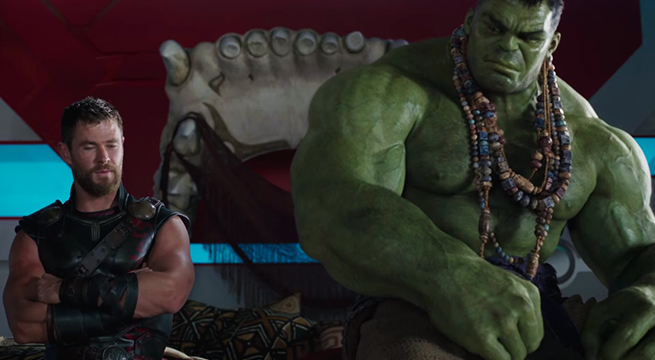 As for other newbies, their characters don’t amount to much in the grand scheme of things, but in the ride that is Thor: Ragnarok, they fit right in. Anytime a wide-eyed Jeff Goldblum is cast (save for Independence Day: Resurgence), it can only amp the fun factor up. There are some disappointments, but not due to performance. The villainous Hela is introduced wonderfully and played up wonderfully by Cate Blanchett, only to be forgotten in long stretches of the movie. Karl Urban, always a joy to watch, is a little underutilized as a basic henchman. Taika Waititi probably possesses the biggest laughs lending his voice to Korg, a rock-based gladiator-turned-gatekeeper of the battle arena. Thor: Ragnarok is a sugar rush in the most positive and negative of ways. But Marvel does deserve some praise for wanting to tweak its formula and try a few new things with one of its less beloved lead Avengers. No matter what…Marvel, uh, finds a way. Photo credits go to collider.com, polygon.com, and comicbook.com. I can honestly say this was the most fun I’ve had at the theater all year. It felt good to just be entertained and to laugh. I agree that it’s not the best out of the MCU, but I think it more than suits its intended purpose(s). Awesome review! Thank you Andrea. I’m in the minority in my fairly substantial dislike of it, but overall, I still think it’s fun enough. Just not to the hype it was getting in my opinion. Thanks for reading! You are not, I was pretty lukewarm on the film as well. I guess watching so much Marvel, you notice a pattern and see alot of these movies are the same and they use laughs to distract you from it.